Hey guys! 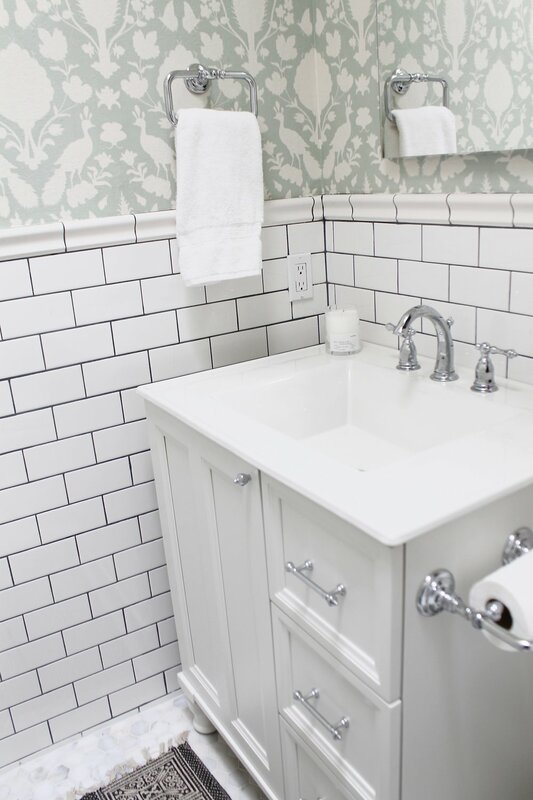 I am so excited to share our completed guest bathroom with you. 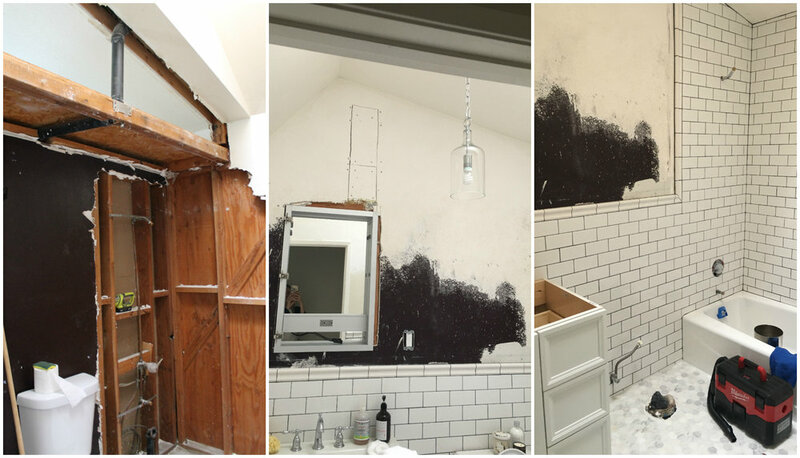 It was a long process because we completely re-did the entire thing since it was in bad shape to begin with. Even though it took a while I would definitely do it again! I am so happy with how everything turned out. It's exactly as I envisioned it. I have both before and after pictures for you so you can see the difference. In the very start we changed part of the actual structure of the bathroom to create more space. Originally there was a shelf on the opposite side of the wall (where our dining room is) so we closed that off, which allowed us to open up the ceiling higher in the bathroom. I have to give credit to Andrew for that idea! We used all Kohler products to give the design a very cohesive feel. Honestly, everything works so well, I'm super impressed with the quality, functionality, and aesthetic. 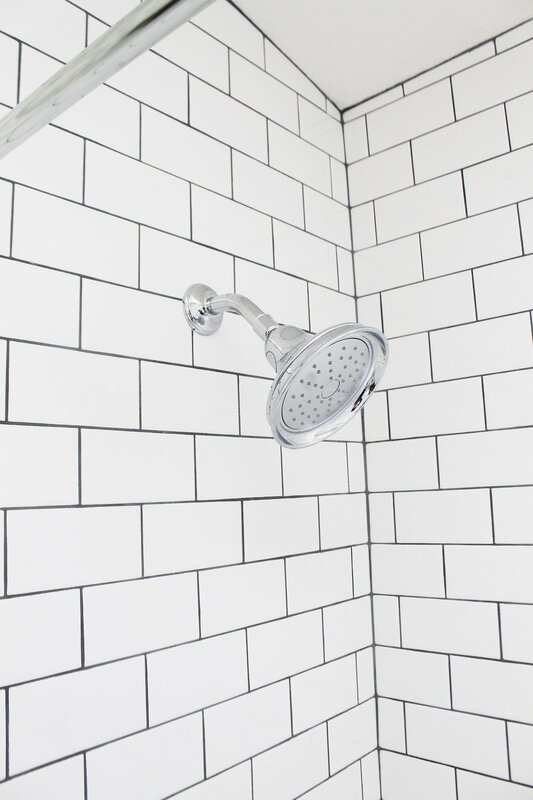 I think I love the shower head the most. Well, maybe the sink!! I hope you all enjoy it as much as I do!Something I really wanted when designing this space was a hotel feel but with a few rustic elements. I think the honeycomb marble tiled floor really helped to create that vibe. Also, having the subway tile come up the wall is something I always loved about hotels I've stayed at in New York. 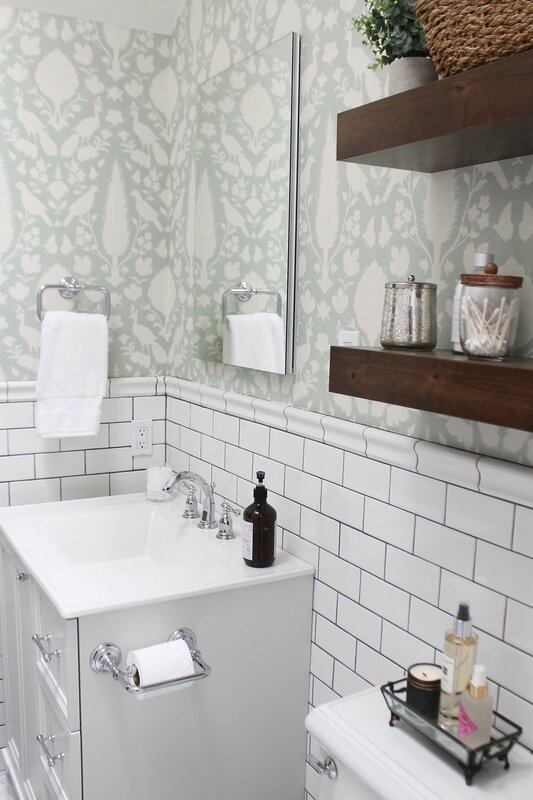 It gives a clean and classic look.I wanted to keep all the big pieces white so that the printed wallpaper would pop. I also chose a very dark grey grout to add some contrast to the all white tile. For the hardware I went with chrome to bring a touch of elegance to the space. I also love that it complements our kitchen! When decorating our home, I like all the rooms to have their own look but keep with a similar style throughout. That way the whole home has a very cohesive feel to it and I can switch out decor accents between all the rooms. All appliances are from Kohler. 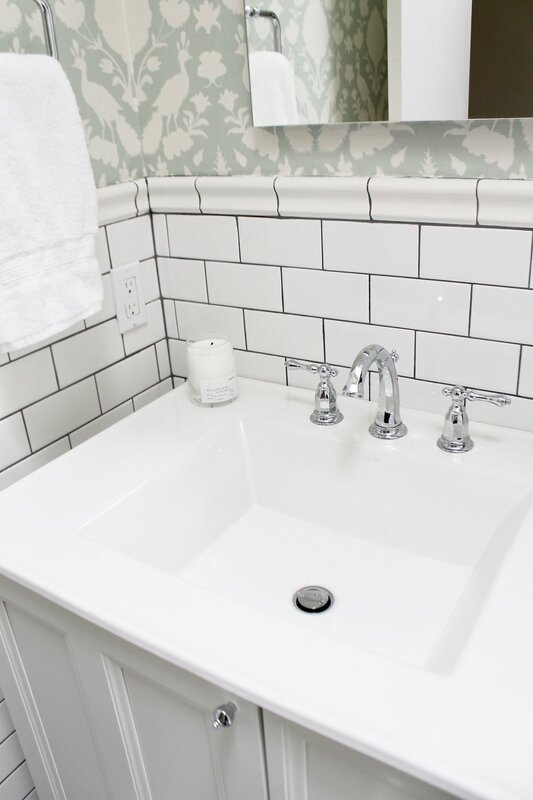 decor accents: homegoods and marshalls---BEFORE SHOTS:Here are some pictures of what the bathroom looked like when we moved in and then a few during the reno process. I'll lay out what the steps looked like. -Rip everything out including flooring, fixtures, tub, toilet and vanity. -Re-route pipe, new drywall and texture. We also raised the shower head about a foot. -Install vanity, toilet, shower fixtures. -Cut out wall to fit mirror, patch up drywall and re-texture. 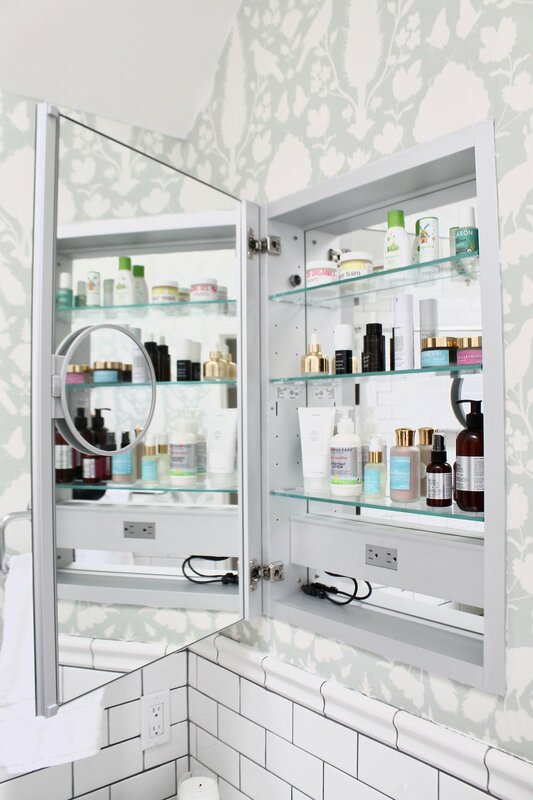 -Install mirror and rest of fixtures. -Apply wallpaper and mount floating shelves. Watch full video below! Thank you to Kohler for providing the bathroom materials!